Dont let a couple of hours of zipping around on a riding lawnmower develop into a cookout, with you being the one on the grill! With Great Days Big-Top Canopy, mowing the lawn is always a shady deal. No more worrying about heat strokes and skin cancer. The Big-Top canopy measures 34 inches wide and 46 inches long, covering and shading the operator at all times. The Big-Top canopy fits all zero-turn riding lawnmowers with roll-bars. It installs quickly with a minimum of drilling or use of special tools. The frame is constructed of 1 inch, aircraft aluminum and adjusts for back or forward leaning roll bars. The Big-Top cover is made of heavy-duty 1/8 inch, UV-resistant, crack-proof polyethylene. All metal components are powder-coat painted for years of dependable service. The Big-Top canopy weighs only 27 pounds and ships by UPS. 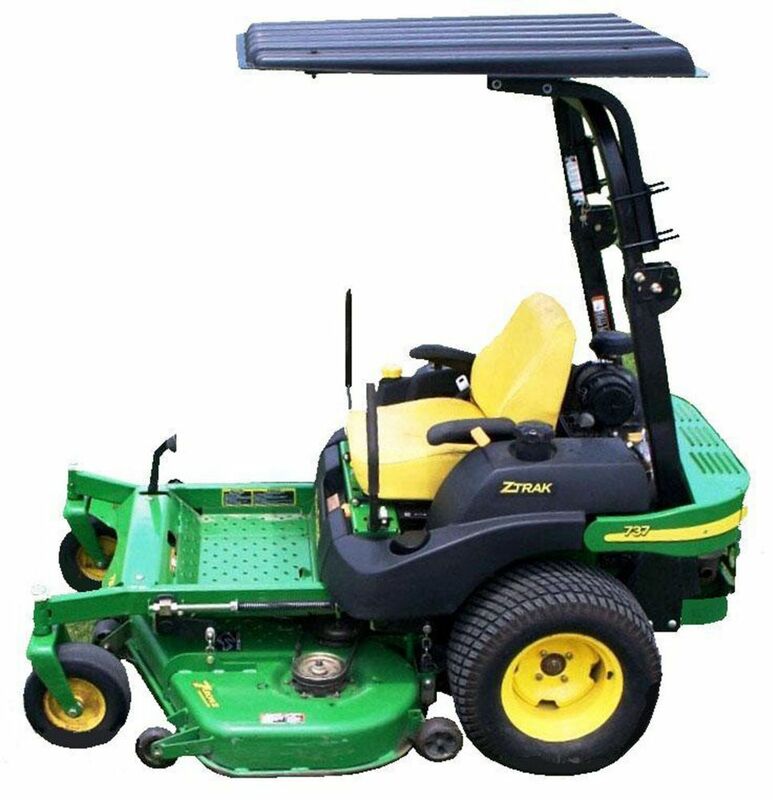 The Big-Top Lawnmower Canopy fits all the brands and models of Zero-Turn mowers that have roll-bars. Fits roll bars 30 inches to 35 inches. 1 year manufacturers warranty against defect in materials and/or workmanship. Contact customer service at 866-649-1918 x110 for more information, parts or installation inquiries. 10' x 10' Sporting event and beach ready recrational grade ez up pop up instant canopy. The Headway compactable frame folds down to 48" to easy fit in the trunk of most vehicles. Lightweight black powder coated steel frame with open top roof design for optimal head room, metal footpad, and pinch resistant locking pins. Includes 210d Polyester Top that is water resistant, fire retardent. Includes Polyester roller bag, grounds stakes and rope. ShelterLogic Monarc Canopy line of all-purpose canopies features an arch shape, light coloured polyethylene cover, and black frame. Appealing to a sophisticated consumer lifestyle, this unique canopy is both attractive and functional. Ideal for shade coverage and protection from inclement weather, this stylish canopy with clean lines and earth tones blends into any outdoor home dicor. It is easy to assemble and conveniently sized to fill most backyard needs. Big Top Zero Turn Lawnmower Canopy Dont let a couple of hours of zipping around on a riding lawnmower develop into a cookout, with you being the one on the grill! With Great Days Big-Top Canopy, mowing the lawn is always a shady deal. No more worrying about heat strokes and skin cancer. The Big-Top canopy measures 34 inches wide and 46 inches long, covering and shading the operator at all times. The Big-Top canopy fits all zero-turn riding lawnmowers with roll-bars. It installs quickly with a minimum of drilling or use of special tools. The frame is constructed of 1 inch, aircraft aluminum and adjusts for back or forward leaning roll bars. The Big-Top cover is made of heavy-duty 1/8 inch, UV-resistant, crack-proof polyethylene. All metal components are powder-coat painted for years of dependable service. The Big-Top canopy weighs only 27 pounds and ships by UPS. The Big-Top Lawnmower Canopy fits all the brands and models of Zero-Turn mowers that have roll-bars. Fits roll bars 30 inches to 35 inches.